We bought this for my wife to commute but soon after she changed jobs and had to drive. 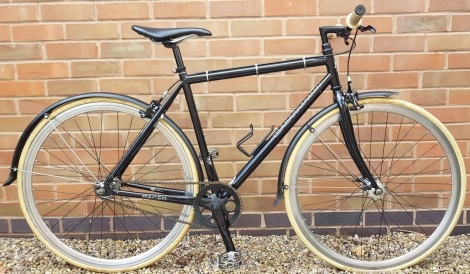 It's a pearl black 2010 Schwinn Racer but we upgraded the brakes to Miche calipers with Specialized levers, swapped the rubbish coasting brake wheels for the single speed ones off my Langster, fitted SKS guards and a new saddle and put matching cream grips and 25mm Schwalbe Durano tires. It's all in good working order and has lots of life left in the tyres, chain and brakes. The wheels have done a lot more miles than the frame as they were on my old commuter but they'll last a long time with the kind of riding this bike is for. The frame is hi-tensile steel so not the lightest but looks good, the seat post hasn't seized so no problem there. We're looking for £150.